Fuselage visited from Tyabb, Vic for the purpose of tube frame repairs and construction of the fuselage wooden monocoque. Repairs to the tubular frames carried out by Aviation Welding Australia Pty Ltd at Archerfield Airport Qld. With the frames repaired the fuselage is reassembled at Combat Aircraft Constructions for the construction of the fuselage wooden monocoque. 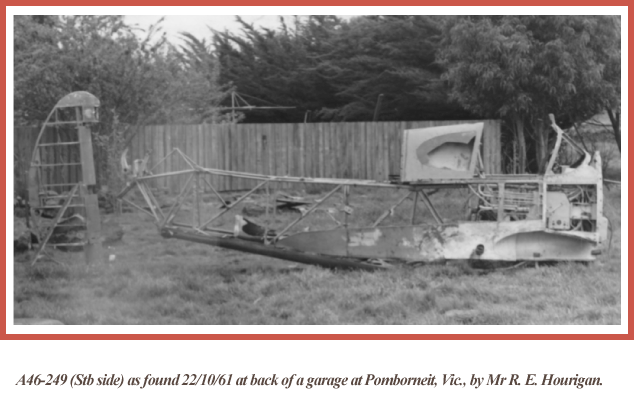 After fabric covering applied, fuselage is returned to Old Aeroplane Company, Tyabb, Vic., for continuation of restoration to airworthy. 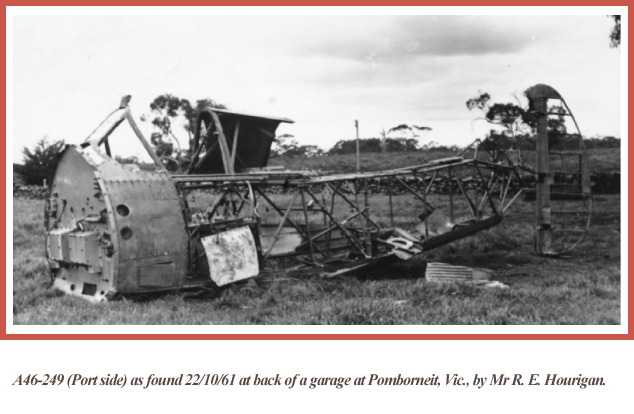 A/C to be issued with Cat "E"
Fuselage remains found behind Vessey's Shell garage at Pomborneit, Western Vic. Transfer to Combat Aircraft Constructions, Brisbane, Queensland for completion of tube frame repairs and wooden fuselage covering build. 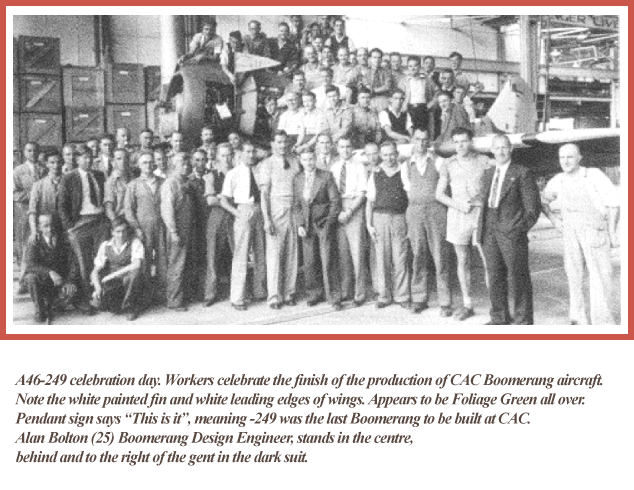 ARL conducted oscillation (fatigue) test on 14 sets of Boomerang wing platforms in 1948 and the wing section off A46-249 was included for test. 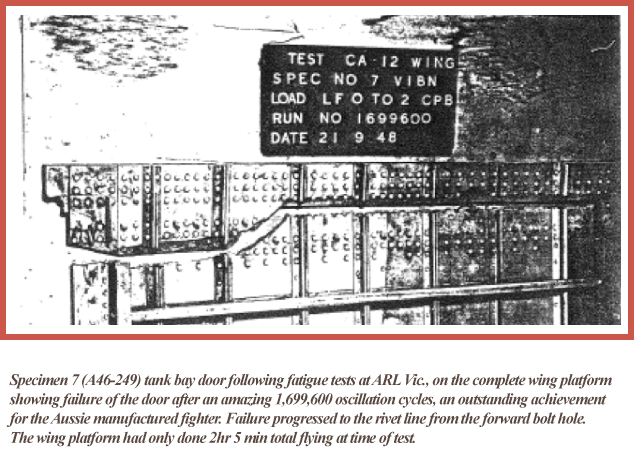 Wings were purposely tested to failure to study how fatigue affects airframes. Below is some information from the official report on those tests. A46-249: Listed as specimen No. 7 tested. 'Aircraft has completed 2 hours 5 mins total flying attributable to test flying. This wing was received in good order, but before being tested had the corners of the cannon shell ejector chute cut-out on lower surface of outer wing ground to a radius of approximately 3/16", and polished. The wing joint bolts were tightened to 18ft.lb. torque. The wing passed through 1,699,600 cycles of oscillation before final failure.